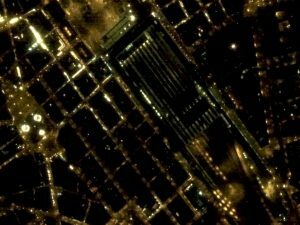 Nighttime imagery from Jilin-1 is currently only offered as a new collection with a 20% or less cloud cover guarantee. We will make up to three attempts for the agreed upon price in order to achieve 20% or less clouds, however even if all 3 attempts exceed 20% cloud cover, payment is still required. To this end, here are the various steps we take to reduce and assess clouds in your Jilin-1 nighttime imagery. (1) To the best of our ability, we will suggest possible Jilin-1 access dates and times with predicted weather conditions. Clients will then be able to reject possible imaging days. (2) After acquisition, we will assess cloud cover as best as possible by comparing a daytime image (as seen in Google Earth) to the collected nighttime image. Our focus will be on luminosity in large light-intensive areas throughout the imagery. (3) Clients are able to provide several key points of interest inside of the 100 square kilometer or greater polygon for additional highly-targeted cloud cover assessments. (4) Images can be rejected with cause by a client; or by our team during the review process. In the case of rejected data, another image (up to 3 total images) will be collected over a given area of interest for the agreed upon nighttime tasking price. If you are interested in samples of Jilin-1 or additional specifications, you can check out our website here. And if you would like a new price list that includes Jilin-1 nighttime imagery pricing or need help pricing out a specific project, send us an email anytime at sales@apollomapping.com. This entry was posted in The Geospatial Times and tagged cloud cover, Jilin-1, monthly spotlight, satellite, Satellite Constellation, satellite imagery, The Geospatial Times by Apollo Mapping. Bookmark the permalink.